First Musk proved that when he Tweets about getting something done, he gets it done quickly. Then he Tweeted about digging tunnels using boring machines to overcome traffic. Now we can't wait to see what he meant by that. Elon Musk is probably the human with the highest productive hours to waking hours ratio on the planet. Heck, he might even be productive in his sleep. How else does someone conceptualize a (literally) groundbreaking new company and implement a major product update in an organization that has over 30,000 employees all inside a week? Certainly not by spending all his time playing the new iPhone Super Mario game. The first of those two updates things went on December 10th, when Musk received a Tweet from a disgruntled Tesla owner. The source of his annoyance were “idiots” at Tesla’s San Mateo supercharger,; the ones who leave their Tesla units plugged in even after they were fully charged. 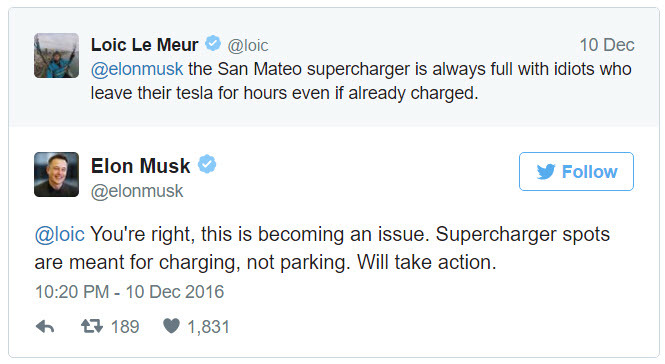 Musk replied acknowledging supercharger hogging was becoming an issue and that he and Tesla “Will take action”. Then, unlike a lot of people in positions of power who say they’re going to take action, he actually took action. By December 17th, Tesla had implemented a measure to deter the bogarting of its superchargers–within a week of the original complaint (though we can’t be entirely sure of how long this may have already been in the works). Quite simply, it’s an idle fee that is levied whenever overuse is detected. Tesla owners are first alerted remotely via an app when their cars are almost fully charged, and then when the batteries reach full capacity. They’re then given five minutes to disconnect their cars. If they don’t, they pay a $0.40 penalty for every additional minute of using the supercharger stall. I’m sure pushing that update was a lot of work, but Musk’s week still wasn’t over. Next stop: traffic. Yes, traffic, that great equalizer–it traps man and Musk alike. The Tesla founder Tweeted about how annoyed he was at being stuck in a gridlock. He went on to say that it had forced him to consider getting a boring machine to start digging a tunnel. Haha. Elon, you zany guy you. But he wasn’t kidding. Or at least that’s what he claimed in a follow-up Tweet. After the traffic rant, Musk came up with a new company name–The Boring Company–and tagline: “Boring, it’s what we do”. It’s an actual company idea that he hopes to establish to rid the world of its traffic woes. 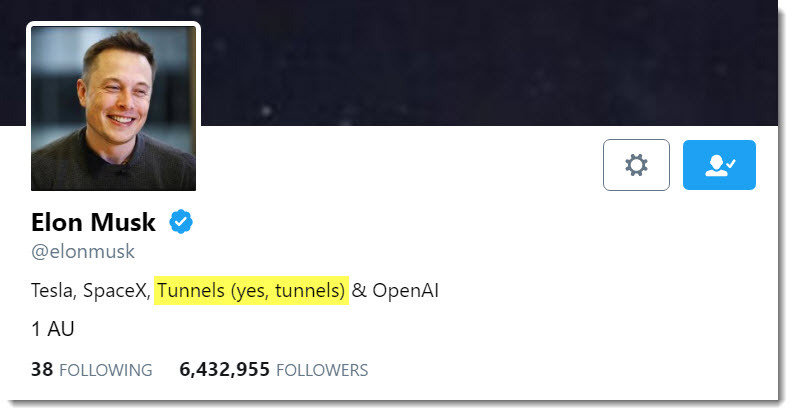 He then updated his Twitter bio to reflect that “Tunnels (yes, tunnels)” joins Tesla and SpaceX on the list of projects on which he’s working. What will the purported Boring Company do exactly? It isn’t clear yet, but if he’s being serious, it sounds like it might be another one of Musk’s moonshots involving some kind of subterranean commuting infrastructure. While details of the project remain elusive, what’s abundantly clear is that Musk is a guy who zigs when others zag. And when you take away his ability to do zig or zag (such as in heavy traffic), he digs deep to find a way out. Also, this guy’s Twitter game is tight. I see no problem with being charged per minute after charged full. It is no different than seeing someone’s car sit in a metered spot after their time has expired. If you can believe all of the hype around this guy, then you are one of the younger crowd. I have hard promises like this from others that have “resources” for my entire life and very few of these big dreams come to reality. There is not stopping this guy. He says, he wants, he does and people listen and believe him. There is nothing wrong with that especially since Musk is actually delivering on his goals! I really love to listen, watch and read about what this guy has in store for the world. His electric cars are just the beginning. He is a mover and a shaker. Things will be getting done while he is around this world. You got that right man! Do you follow this guy on social media? One of my top ten followers for sure! If Musk says he is going to build a tunnel, people should just start to listen to the guy. He has the resources, so you just never know. This guy can get things done, I think that has become quite obvious. Now if regulators could just stop from holding him back, we could really see where he is headed! Musk has some great insight and if you listen to him speak, you will see that he also knows what the hell he is talking about . He is not just another geek with too much money. This guy is going to MOVE the United States into a new direction.